Oral history suggests the Lynes family emigrated to the Lowcountry in one of the first waves of Huguenot settlers who found sanctuary in the Carolina colony after King Louis XIV revoked the Edict of Nantes, which provided religious freedom for French Calvinists, in October 1685. At the relatively young age of 22, Lynes began managing a number of rice plantations on the Savannah Back River, including Cherry Hill Plantation which he managed for the Ingrahams (1829 -1834). As his reputation grew, he assumed management (1834-1837) of one of the Back River's (and indeed America's) largest rice plantations, Delta Plantation, owned by Judge Langdon Cheeves, Speaker of the S.C. House and president of the new United States Bank, which encompassed 2,752 acres. Other Savannah-area plantations in his management portfolio included James Hamilton's Fife Plantation on Pennyworth Island (1838 -1839) and J.P. Williams's Swamp Place, a rice plantation on Union Creek, a tributary of the Savannah Back River, where today I-95 crosses the GA/SC state line. While working in the lower part of the state, Lynes simultaneously added the management of several local plantations including Exeter Plantation for the Broughtons (1830), The Blessing (1831), and property belonging to John Myrick (1832-1834). From 1843 to 1855, he managed Comingtee Plantation for Keating S. Ball. During this time, Dr. John Beaufain Irving published his series of newspaper essays about the Cooper River Plantation (later to be published in a collection know as A Day on the Cooper River), noting the "fine appearance" of the property. After his father's death, Lynes moved home to Foxbank Plantation (1) in 1852, where he lived until his death in 1870. 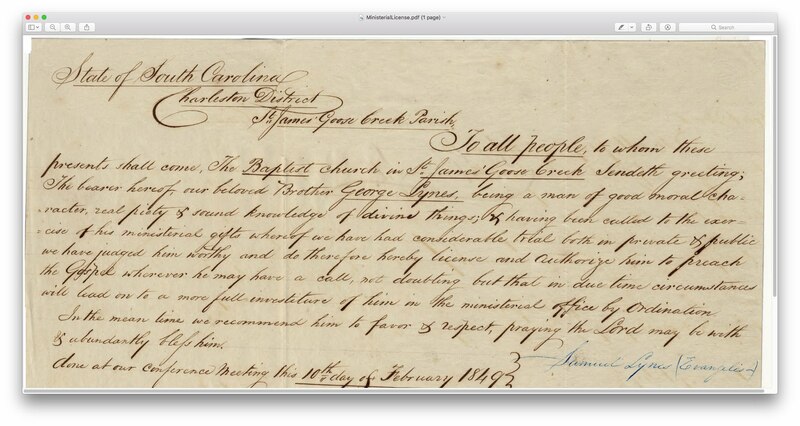 He served as a Baptist minister (see copy of ministerial license below, from the archives of The Charleston Museum) and was active in regional church affairs. Contemporary Daniel Huger said of Lynes, "He is, I believe, a kind and good man, active, industrious, and sober."